On this day in history one of the worlds most iconic screen goddess’s, Elizabeth Taylor (February 27, 1932 – March 23, 2011), marries for the first time. For the regular folk this is no big deal, but for Elizabeth it would be the start of two lifelong love affairs; one with marriage, the other jewelry. With a total of 8 marriages under her belt, to 7 different men (Richard Burton was a repeat), there were few who knew it better than Elizabeth. In 1950, an 18 year-old Elizabeth Taylor married Conrad Hilton, heir to the famous hotel chain, in a ceremony in Los Angeles attended by over 700 guests. Elizabeth hired costume designer Helen Rose, whose dressmaking skill would eventually earn her two Oscars for work on films The Bad and the Beautiful and I’ll Cry Tomorrow (she also went on to design the wedding dress for Grace Kelly‘s marriage to Prince Rainier of Monaco in 1956!). 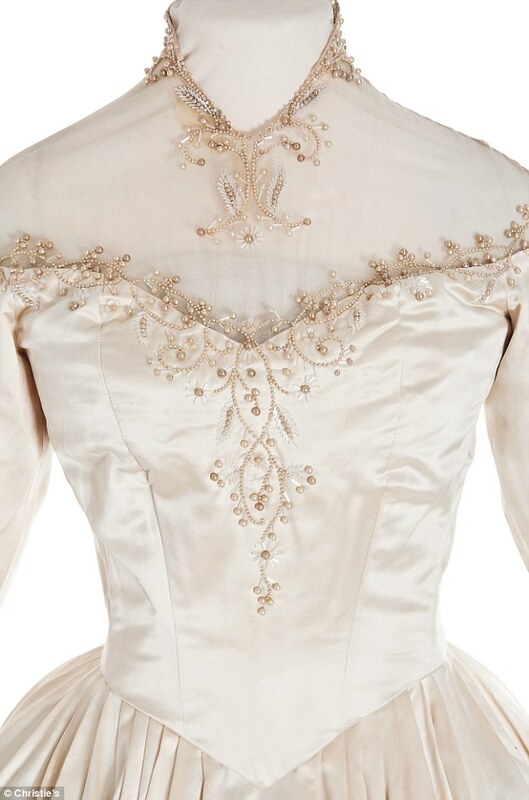 Opting for a classic style, Elizabeth Taylor wore a lace and ivory satin dress, with a full skirt and pearl embroidery. The wedding dress went down in fashion history as the epitome of 50’s glamour and was eventually sold at auction at Christie‘s. Elizabeth’s first engagement piece was a $10,000 4 carat diamond platinum ring. 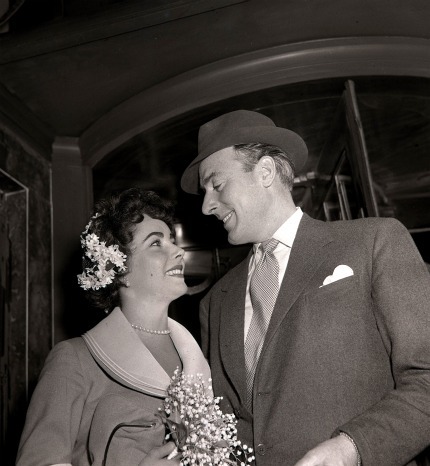 After the breakdown of her short-lived marriage to Conrad Hilton which lasted only nine months, Elizabeth Taylor married Michael Wilding, a British actor twenty years her senior, in 1952. As it was her second trip down the aisle Elizabeth chose to show her sophisticated side and opted for a modest suit featuring a fitted jacket with large white collar and a knee-length flared skirt. Just like her first wedding dress, this discrete and elegant outfit was designed by Helen Rose. Elizabeth’s engagement ring with Michael was a cabochon sapphire that had a domed, polished effect, rather than a faceted look. She was fond of rare styles that set her apart, and by wearing a sapphire ring she began a trend with many couples at the time opting for sapphires instead of diamonds. After five years of marriage, Elizabeth Taylor divorced Michael Wilding and married the American film producer Mike Todd in 1957. It was to be her only marriage that didn’t end in divorce, as Mike Todd died in 1958 when his private jet crashed. Many say Todd was the great love of Elizabeth’s life and that she would have stayed married to him until the end. The actress revealed in later years that this was true to an extent – he was one of the three true loves of her life, along with Richard Burton and her jewelry! 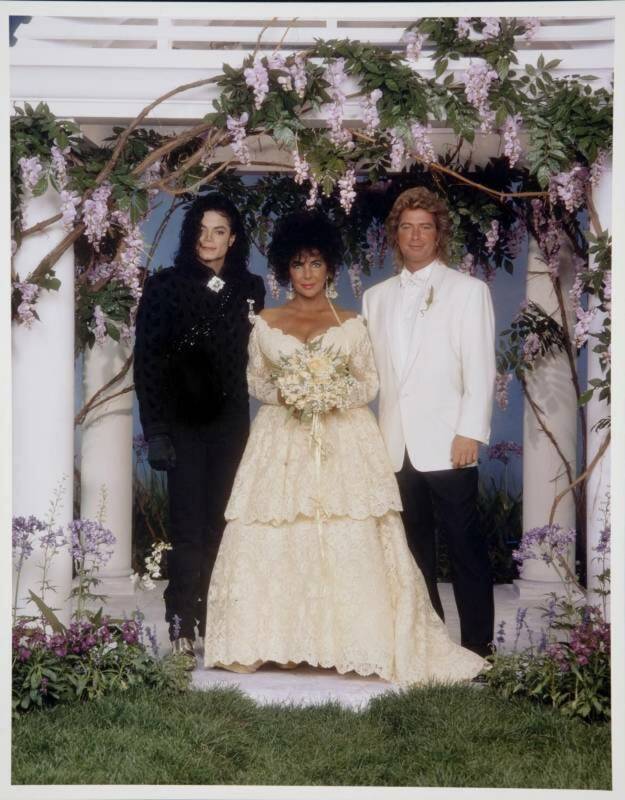 Their wedding was an intimate affair in Acapulco, where Elizabeth Taylor wore a light, hooded organza dress. The American actress started her serious jewelry collection with her engagement ring from Mike Todd, which featured a 29 carat diamond. Devastated by the death of her previous husband Mike Todd, Elizabeth Taylor found comfort with his best friend, Eddie Fisher, who she married in 1959 in Las Vegas. At the intimate ceremony which took place in the synagogue, the actress moved away from her usual pale tones and wore a green silk dress with hood and long sleeves. Continuing the unconventional theme, Fisher proposed to Taylor with a bracelet. Obviously this was no ordinary bracelet but a 40 carat spectacular, made with 50 diamonds! Elizabeth Taylor and Richard Burton famously began their affair in 1964 whilst shooting the film Cleopatra in a scandalous romance publicly condemned by the Vatican. 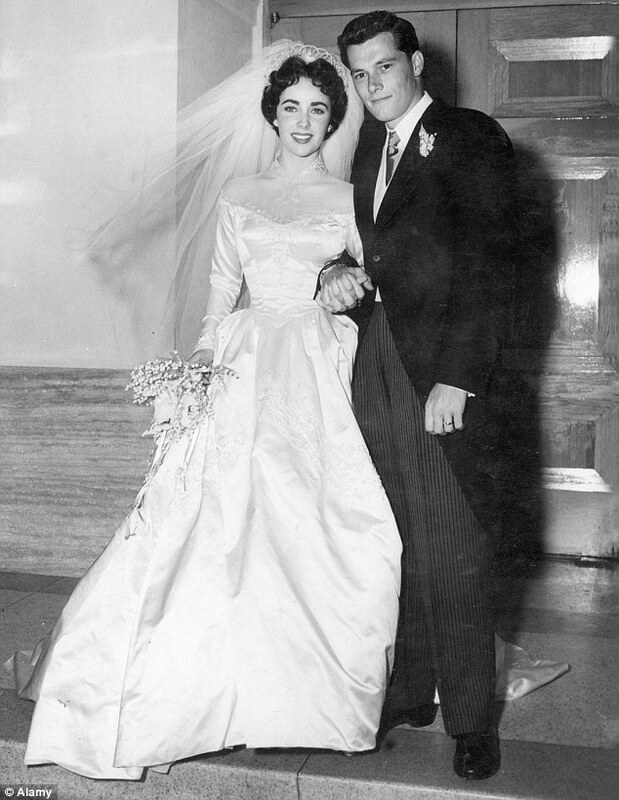 After both divorced their respective spouses they tied the knot in 1964 in Montreal. This time, the screen siren called on Irene Sharaff, Cleopatra‘s costume designer, who created another colourful number in canary yellow chiffon. 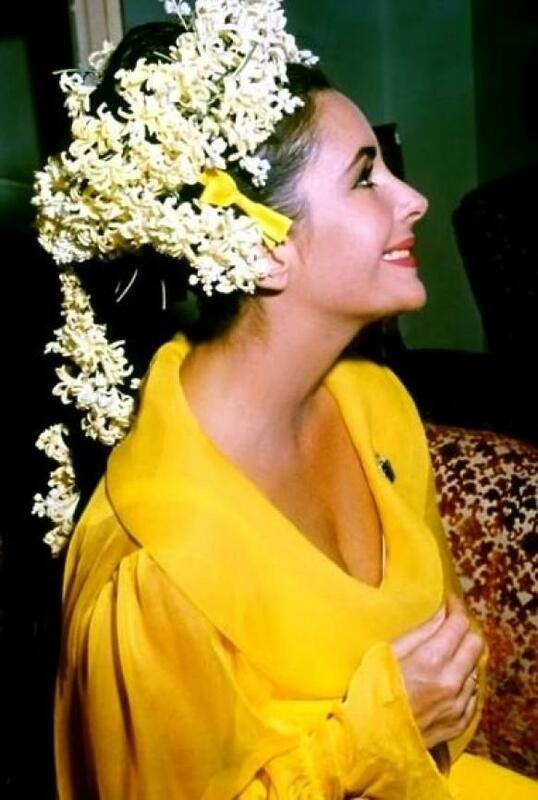 The actress completed the look by weaving hyacinths and lilies of the valley into her impressive braid, and adorned her dress with a diamond and emerald Bulgari brooch. The Bulgari broach was the piece of jewellery that Burton proposed with and featured a 18.61 carat emerald surrounded by diamonds, which could be detached and worn as a brooch. Burton famously said “The only Italian word Elizabeth knows is Bulgari”. 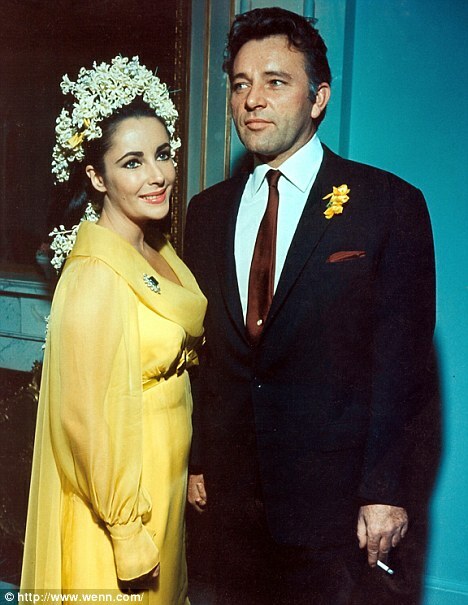 After a swift divorce in 1974, Elizabeth Taylor couldn’t resist re-marrying Richard Burton in 1975. She confessed “Our love is so furious that we burn each other out”. On the banks of the Chobe river in Botswana , the actress renewed her vows in a hat-trick of a colorful tie-dye dress by Gina Fratini. The dress ranged from emerald green, to violet, to turquoise and embellished with tiny feathers. Five years into their first marriage, he gave her one of the most renowned diamonds in the world – the Krupp asscher cut, now known as the Elizabeth Taylor diamond. An incredible 33.19 carats, it’s widely reported that she wore it almost daily. 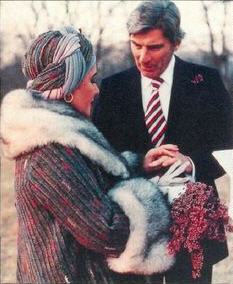 In 1976, after her second divorce from Richard Burton, Elizabeth Taylor married senator John Warner. Without witnesses, the actress and the politician exchanged vows on his farm in Virginia. On a hilltop in the middle of Warner‘s cattle farm, Elizabeth wore a violet cashmere dress under a tweed and fur coat, opting for a matching turban to top off the look. Warner’s proposal gift has never been quite established: some say he proposed with a diamond ring, others say a band of rubies, diamonds and emeralds. Most certainly Elizabeth Taylor was a traditionalist, saying “At first, I guess I didn’t know what was love and what was not. I always chose to think I was in love and that love was synonymous with marriage. I couldn’t just have a romance; it had to be a marriage…”. NO-ONE CAN EVER TAKE HER PLACE. VERY BEAUTIFUL VERY BEAUTIFUL.